On the street, however, poverty is at its eleven year high and unemployment is the highest in over 27 years . It is certainly bad news for those without investments, as their earning power has decreased. The USD was worth 107 Japanese Yen just a year ago, it is now just worth 90. Today’s drop in value of the USD versus the Yen was over 1.5%! For currency traders, some interesting currencies to look into include the Singapore Dollar (SGD) which has gained 20% on the dollar in just five years, or the Japanese Yen or Euro which has gained the same percentage in the same time period. One must also consider which government programs have been enacted in recent months or years that will effect the value of these currencies, such as the the US, Chinese, and EU stimulus packages which have drastic differences in allocation. To those that say that the government is going too far in blocking the formally half a billion dollars in bonuses to derivative traders at AIG, I say they are wrong. Think about this, without government aid AIG would now be but a memory and most people working for AIG would now be unemployed and looking for work. AIG is actually one of the main culprits in causing the downfall of our economy in the first place, and now they are acting as though they deserve a reward for managing to steal more money from the American people. This is a company who has received billions upon billions in taxpayer money to revive themselves out of the death they had brought upon themselves through risky high return loans, mortgages, and meddlings in the derivative market. AIG executives, instead of being humbled by the generosity of their government and those taxpayers and their representatives who supported their bailout, are now acting just as cocky as before and going about business as usual. Iowa Senator Chuck Grassley was quite sharp and critical of executives at AIG, and you can read what he said here . I was quite surprised at the level that he took his case, especially being a Republican. In case you haven’t heard or didn’t follow the link I put, I would just say he basically told executives to follow the Japanese way when they don’t do so well for their investors and or company. Now I in no way agree with what Grassley said, but I do think that the way executives handle themselves and their companies should change. Especially when you are an executive of one of the companies that is being “bailed out” from certain doom. Congress is probably going to vote on a measure set forth by Rep. Steve Israel to tax their bonuses 100% . Firstly, the title is not a typo. The New Deal, which was implemented under Franklin Delano Roosevelt during the time period of 1933 to 1939. During this time national unemployment was 25% and even higher in certain industrial and mining towns. The result of the New Deals (there were two) were mediocre at best, but did include the repeal of prohibition (a time when making or drinking alcohol recreationally was illegal). A number of economists believed that the New Deal (also used to represent both New Deal 1 and 2) actually prolonged the Depression. This Depression did not end until WWII thanks to British buying of war materials from the US and increased production of war gear. The second New Deal, popularly known as the “Stimulus Package”, is making it’s way through. It is in fact a spending package by the Government to spur new jobs and more demand in various sectors of our economy. Although it is currently around 850 billion dollars, it is bound to increase as time goes on if the economy does not recover quickly enough. 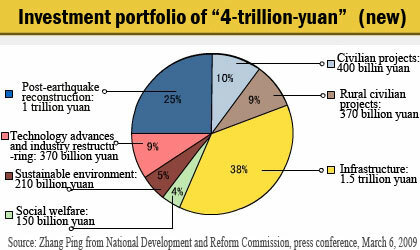 Much of this goes into infrastructure development, and about half of it is going towards tax breaks. A few restrictions on the plan are that any buildings built from it must be built from American materials, putting caps on executive pay. A few of the companies receiving aid (not just from the stimulus, but also from the bank bailout) are Citigroup, Bank of America, and American International Group (AIG), were notorious for their exectutives pay being far over the $500,000 level. For example the CEO of Citigroup in 2007 made a $3.1 million dollar salary. A modern day little red hen may not sound like or appear to be a quotable authority on economics but then some authorities aren’t worth quoting. I’ll be right back. “Not I, ” said the cow. “Then I will,” said the little red hen. And she did. The wheat grew tall and ripened into golden grain. “Who will help me reap my wheat?” asked the little red hen. “Then I will,” said the little red hen, and she did. At last the time came to bake the bread. “Who will help me bake bread?” asked the little red hen. “Then I will,” said the little red hen. “Excess profits,” cried the cow. “Capitalist leech,” screamed the duck. “I demand equal rights,” yelled the goose. And they painted “unfair” picket signs and marched round and around the little red hen shouting obscenities. And they lived happily ever after, including the little red hen, who smiled and clucked, “I am grateful, I am grateful.” But her neighbors wondered why she never again baked any more bread. Let us hope that it doesn’t come to that point. It is always the case where when big issues come up, or at least are reported to come up, the government steps in to solve them. The way the government solves these issues is far-ranging, and could be as simple as increasing spending on a particular area such as defense or even to the extent of creating a new department. When 9/11 came, government created the Department of Homeland Security. When this economic crisis came, government bought out Fannie Mae, Freddie Mac, and an array of banks were “bailed out”. Then the car companies were “bailed out”. Now, we are going to spend probably over 1 Trillion dollars in this new economic stimulus plan. My only problem with this plan is that it is quite vague and most people have little idea where this money is going to and who in which sectors stand to gain from it. Most people believe that this is a necessary evil to recoup from unsavory lending practices carried out within the last 5 to 10 years. I have taken international economics before, and one thing I know to be true that putting on tariffs to trade during an economic crisis will only worsen it. This “tariff-like” plan will do more to harm our international trade and the world economy. I personally believe that instead of increasing spending on frivolous projects, the government should have the people decide on what they want to do with the money. How is that done? Simple. Decrease taxes.